If you need a good political costume idea, how about disguising yourself as George W. Bush, the 43rd President of the United States, for Halloween! 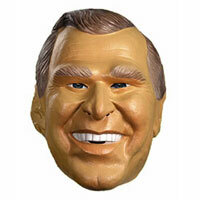 A new zombie George Bush Halloween mask has also been released and for sale at a great bargain price! 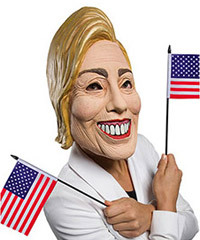 If you want to add a bit more character to your President Bush vinyl mask, you will want to wear these parody Halloween masks for political events or Halloween parties. Check out these cool president masks below! 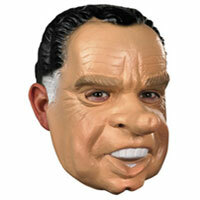 Transform your face into the former president of America with this full vinyl Halloween mask of George Bush. A great mask to party with on Halloween or the 4th of July! 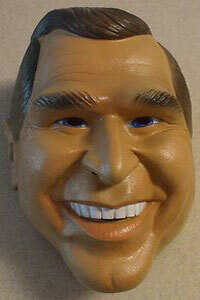 A good caricature mask of the former President George W Bush. Good detail Over the head mask made of vinyl.